John Gosden’s Coronet won the Ribblesdale Stakes at Royal Ascot last summer and ran several fine races in defeat, most notably chasing home esteemed stablemate Enable in the Yorkshire Oaks on the Knavesmire in August. She went on to finish fifth in the St Leger and third on Champions Day at Ascot, and she was dropped in class and distant on her seasonal bow. Frankie Dettori cut a confident figure in the saddle throughout the 10-furlong Group Two and committed for home over two furlongs out. The 2-1 favourite idled in front, but was ultimately far too good for her rivals, passing the post a length and a half clear of Horseplay. 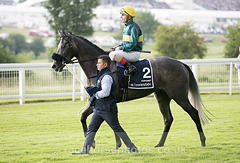 Dettori said: “She’s the best ride. She’s brilliant, she’s honest and she’s got an engine. Gosden said: “That was a great return. She’s been training nicely. “We were perfectly aware that a mile and a quarter on top of the ground is not her favourite, but she did it very well and when we step her up to a mile and a half she’ll be even better. The Middleton Stakes was first run in 1981, and it was originally restricted to three-year-old fillies. The first running was won by Pipina. The present version for older fillies was introduced in 1997. It initially held Listed status. It was promoted to Group 3 level in 2004, and to Group 2 in 2010. The Middleton Stakes is currently staged on the second day of York's three-day Dante Festival meeting. It is run on the same day as the Dante Stakes.